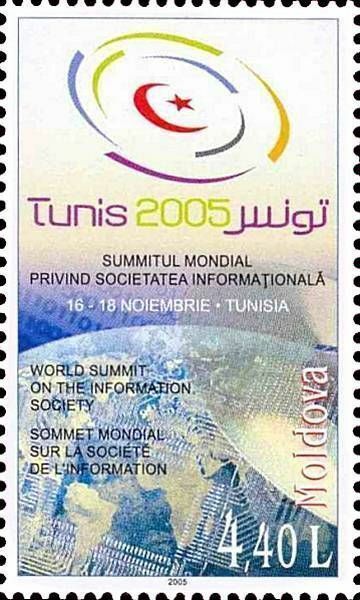 On 14 September 2005, the Post Office of Moldova (Poșta Moldovei) issued a postage stamp with the title World Summit on the Information Society. Tunisia. The issue comprises one stamp, with an associated cancellation (postmark) and first day cover (FDC). The designer was Vitaliu Pogolşa. The printing was performed by Tipografia Centrală, Chişinău. The World Summit on the Information Society (WSIS) was a pair of United Nations-sponsored conferences about information, communication and, in broad terms, the information society that took place in 2003 in Geneva and in 2005 in Tunis. One of its chief aims was to bridge the so-called global digital divide separating rich countries from poor countries by spreading access to the Internet in the developing world. The conferences established 17 May as World Information Society Day. Read more.. This article uses material from the Wikipedia article 'World_Summit_on_the_Information_Society', which is released under the Creative Commons Attribution-Share-Alike License 3.0.